With more than fifteen years of experience, GetResponse continues to deliver excellent-quality online marketing solutions that empower entrepreneurs and make their businesses grow. The provider operates globally with offices in Poland, the U.S., Canada, Malaysia, India and Russia with more than 300 passionate professionals on board. 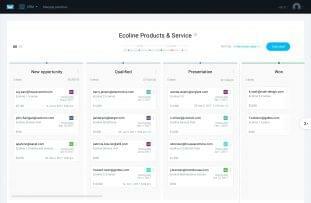 GetResponse targets a wide range of customers which includes email-marketing beginners, growth-focused marketers and SMB’s, marketing pros with advanced needs, and businesses seeking scalable, high-performance solutions. GetResponse does offer a free 30-day trial. GetResponse does not offer a free version; however, there is free on-boarding. Custom fields and tags for precision targeting. Email Marketing: Users can create beautifully-crafted, interactive emails to increase sales and subscriber engagement. In just a few easy steps, you can have an entire campaign up and running. 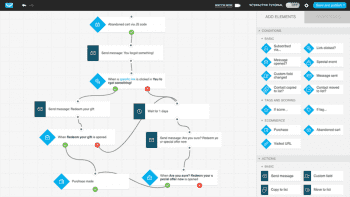 Marketing Automation: No matter how big or small a company may be, anyone can use GetResponse’s drag and drop creator to make fully scalable workflows. Users can also track subscriber behavior in real time. Landing Pages: Users can easily create 100% responsive landing pages and web forms. They can create top-notch web pages for opt-in, thank you notes, sales, webinars, and much more in less than ten minutes — without touching a single line of code. Webinars: With GetResponse webinars, users will not only acquire new leads, but also nurture existing customers thanks to the advanced integration with all GetResponse features. Forms and Surveys: Users can create more developed lists with custom signup forms and list building apps. With intuitive surveys, businesses can learn more about their new customers and fine-tune your marketing approach. 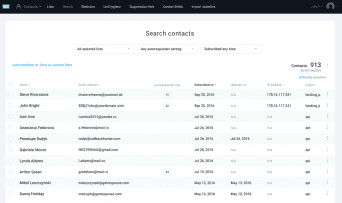 List Building and Management: Users can build an in-depth contact list with a wide variety of tools like single opt-in imports, advanced search and filtering, list hygiene, and built-in integrations. Make use of custom fields, tags, and scoring to filter and segment lists for sharper targeting. Analytics and Optimization: Find out what customers want, with a big-picture view of opens CTR goals, mobile views and OS reports, subscriptions, and geolocation data. Users can also split test and compare newsletters, landing pages, and web forms to make your next move. Design Tools: Whether users are new to email marketing or experienced marketing veterans, GetResponse’s design tools will thrill customers with first-class designs in minutes, without any coding required. Account and Campaign Management: GetResponse’s account and campaign management features make it easy for users to customize content, deliver timed messages accurately in every time zone, and manage your multinational team with freedom and control. Integrations: Users can connect with CRM software, eCommerce platforms, and other popular tools used to sell, market, and support customers. There are over 100 ready-to-go API integrations to choose from; plus, users can develop their own custom application. Enterprise Solutions: Improve your organization’s ROI with GetResponse’s enterprise solutions. This includes: dedicated account management, your own powerful server built for big sends, in-depth training, and ongoing consulting. There are lots of help and support options on GetResponse’s website. Users can click through an FAQ section, watch tutorials and webinars, take advantage of their 24/7 livechat any day of the week, send emails (supports 7 different languages), and call at: US 1-877-EMAIL-GR / US 1-877-362-4547 Monday to Friday from 9AM to 5PM EST. 2014 Gold, Silver, and Bronze Stevie Awards for a proactively coaching strategy, Silver for innovations in technology and Bronze for the new-hire training program. 2012 International Business Times, Ranked 3rd for Top Email Marketing Platforms. GetResponse is a unique way of tackling email marketing whether you’re a new business owner or an experienced professional. Throughout their website, the company proudly states how many of their features work without having to touch a single line of code, within minutes, like the ability to integrate smoothly with CRM software. Customization also plays an important role in GetResponse’s identity. This ranges from features to price plans provided. GetResponse seems to win at least one award each year for its outstanding service as an upcoming email marketing product, meaning by this point, they should not be taken lightly. There are customized price plans designed to cover every type of business with a few significant options to choose from. Users can pay a monthly fee for whichever plan they choose; however, GetResponse also provides users with a yearly and biyearly prepaid plan that saves users money. Many providers offer a one-year plan, but not many offer a two-year plan. It’s a little unusual, but if you see your business committing, or you’re not a person that’s quick to make changes, it’s an option worth considering. With each plan comes more features. There is a noticeable lack of options in the Email plan compared to the Pro, Max, and Enterprise plans. GetResponse mentions multiple times that many of their features do not require coding. that their target customers are new/small business owners. We believe pushing accessibility is important because it will encourage users to upgrade to the more involved service plans if/when their needs change. On the flip side, there might be other services that provide more features on their basic plans, so shop around before committing. Integration tools also seem to play an important role in GetResponse’s success. Features integrate with each other and with other business software. For example, webinars integrate with all of GetResponse’s features to acquire new leads and maintain existing customers. With GetResponse, you can connect with CRM software, ecommerce platforms, and other popular tools your team uses to sell, market, and support customers. This makes the contact list feature much more useful to your business because important phone calls, webinars, and meetings will go much more smoothly. You could know everything about your customers and important contacts before saying a word to them in person. GetResponse is an integration- and customization-based email marketing program anyone could use. Inexperienced business owners can take advantage of the coding-free features, 100-plus integrations, and ease-of-use while marketing veterans make use of their account and campaign management, analytics and optimization, and list building and management features that closely resemble the CRM software they may or may not already be familiar with. There is a big gap between their cheapest price plan and their most expensive regarding available features, which makes it seem like this is a program fit for already-established businesses more than newer and smaller ones; however, everyone can find something to help their business’ email marketing improve significantly. What Do You Think of GetResponse?